2birds1blog: WE GOT A NEW LOOK! More on that later. Sleep first. i c a n ' t s t o p r e a d i n g t h e e x c e r p t f r o m y o u r b o o k .
is the Jessica Walter mentioned in the dedication in the excerpt THE Jessica Walter? because I sincerely hope so. "Sharing an author bio is an uncomfortably intimate experience for both of them." Can't wait for this book! awww such a nice dedication!! What is the best way/time/place to buy the book, so you guys make the most money off of it? Meg, is the book going to be released in Kindle edition? You are welcome to beat me with one for asking that snobby of a question. OF COURSE. Catch all the Jessica Walter mentions in the book and win a prize! We get more money if you buy it for an e-reader (THAT'S WHAT THE YOUNG KIDS CALL IT, RIGHT?! ), plus you get bonus material. And I don't think it makes a difference if you pre-order it or buy it the first week it comes out. I think. And thank you for asking! “It’s My Party (And You’ll Die if I Say So)” needs to go on my playlist right now. I'M GONNA MAKE YOU RICH! FYI, Meg, I preordered both books, but I wanted that free super-saver shipping. 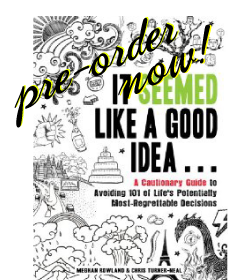 So I also ordered the next book on my wish list--"Not Quite Adults: Why 20-Somethings Are Choosing a Slower Path to Adulthood, and Why It's Good for Everyone". Seriously. Hope that'll give you some good results in the "People who bought this also bought..." window. Shill the book. What, people consume things for free and God forbid you should advertise about your book? Sorry, that kind of commentary is getting on my nerves lately. People getting pushy about free content. Just me, I guess. YOU DEDICATED THE BOOK TO 2B1B READERS! I LOVE IT!!! 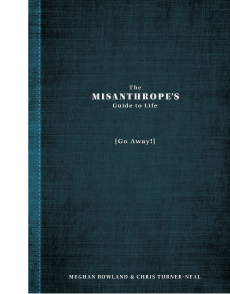 soooo touched that you dedicated The Misanthrope’s Guide to Life to the blog readers! :D you lovable curmudgeon, you! I just pre-ordered the book solely because of Jessica Walter. OMG I cannot wait! Bad credit loans 12 months are absolutely free from any kind of credit check. In general, all those who had been hesitant to apply for a bad credit loan scheme. On 'Dallas', on Cupid, on Donder, on Blitzen!